QIP Mobile Messenger is a mobile version of the popular messenger QIP, which is used by more than 20 million people in Russia and abroad. 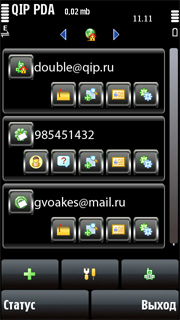 Users can send each other messages via protocols: ICQ, XMPP, Mail.ru. Includes support for skins, animated emoticons and fine-tuning of notifications (sounds, vibrations, LED, pop-ups and floating icons).